Women for Climate Justice contingent at the People’s Climate March. Credit: Emily Arasim/WECAN.“There is no thing as a single-issue struggle because we do not live single-issue lives,” said Audre Lorde. She was right, of course, and this quote still resonates today. Globally movements of movements are intersecting and coalescing and working together. And this is crucial. Because it takes everyone to change everything, and we must fight oppression in all its forms, at all times. On 29 April, I joined 300,000 people in Washington DC for the People’s Climate March. A march for climate, justice and jobs. It was a sweltering hot day, record-breaking for this time of year. (Though, such records are now broken each year, with temperatures continuing to rise). I was in DC to join the march’s ‘Women for Climate Justice’ contingent, challenging, as per our statement, “a new US administration that promotes climate skepticism, the advancement of fossil fuels, an extractive economy, environmental racism, bigotry and inequitable treatment of women and girls” – and rising up for a healthy, just and thriving world. In 2014, the first large-scale People’s Climate March was held in New York City. Then, as now, we were mobilising women’s rights and feminist groups to participate. 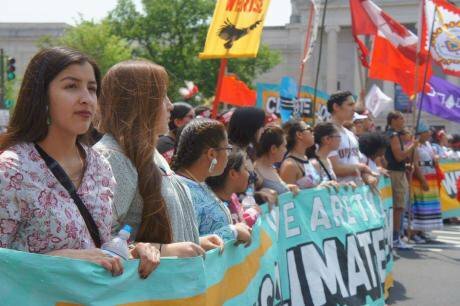 Making climate change a feminist issue and centering environment in the women’s rights movement has been core to the Women's Environment and Development Organization (WEDO) since its founding in 1992. While not immutable, binary nor universal, gender shapes expectations, attributes, roles, capacities and rights of women and men around the world. We see that environmental degradation and increasing climate chaos work to further entrench already existing inequalities. Women often have more limited access to resources and more restricted rights, including to land, mobility, and voice in shaping decisions and influencing policy. ...environmental degradation and increasing climate chaos work to further entrench inequalities. At the same time, gender roles generally ascribed to women such as informal, reproductive work often relate to caregiving for households and communities, caretaking of seeds and soils, maintaining traditional agricultural knowledge, and responsibility for natural resource management such as firewood and water. This is the context in which women are challenging our environmental crises – fighting always against multiple forms of injustice. It is also why it’s critical for feminist analysis to include a strong focus on environmental and climate justice. Of course, for women in communities around the world, indigenous women, land defenders and water protectors, the linkages in these multiple forms of oppression are not new. For years, from the Chipko movement in India, to the fights of the peoples of COPINH in Honduras and the Sioux Tribe of Standing Rock – grassroots movements have been articulating and documenting the intersectional nature of resistance. But in governance, financing and mainstream development arenas, a siloed system has often challenged the development of a more intersectional global feminist resistance. Indigenous Women’s Day at COP21, sharing stories on resistance and solutions to environmental struggles. Credit: Christine Irvine/ Survival Media Agency.Last year, for example, I attended the 2016 World Conservation Congress, entitled ‘Planet at a Crossroads’, held in Hawaii, USA and attended by over 8,000 conservation practitioners and scientists. The conference outcomes were to provide a blueprint for the next 30 years of conservation. Yet, despite having a very strong mandate for gender equality and women’s rights to be included in that agenda, and despite strong advocacy by groups like the Indigenous Women’s Biodiversity Network, not one Congress motion made mention of women or gender issues. From that meeting, I traveled directly to the AWID Feminist Forum in Brazil, discussing our ‘Feminist Futures’. In this progressive feminist space, real progress has been made in terms of drawing links with environmental issues, and ‘climate and environmental justice’ was one of the main umbrella themes. (This was notable as the previous edition, three years prior, had very little space for environmental issues, despite being held in parallel to Earth Day and right before the Rio+20 Earth Summit). There is no doubt in my mind that while this is a moment of great uncertainty, it is also a moment for great global movement-building and feminist revolution. On 13 May, I will join a group of feminist activists at the 2017 Nobel Women’s Initiative conference to discuss strategies and tactics for feminist resistance amidst the growing global backlash against women’s rights, human rights and peace. We must draw upon feminist analysis and vision to resist authoritarianism and violence – and shape our calls and work for a just, peaceful and healthy planet for all. Movements are becoming increasingly intersectional and this must continue. The People’s Climate March (PCM) felt transformative not because of the numbers in the street, but because of the diversity of voices. Adopting a frontlines-first approach, it was led by indigenous peoples, immigrants, grassroots organisers, people of colour, refugees, unions, and workers. Chants called for ending fossil fuels as loudly as they called for justice for black lives, indigenous rights and women’s rights. At one point, a group of anti-abortion protesters were deafened as marchers joined in unison to declare, “My body, my choice” echoed with “Her body, her choice”. Intersectional feminist leadership is essential to address structures, systems and values that undermine gender equality and women's rights. Intersectional feminist leadership is essential to address the global structures, systems and values that undermine gender equality and women’s human rights and stand in the way of transformative development justice. In a world ravaged by countless, connected crises, injustices, and inequalities, we need champions of women’s human rights and all human rights. In the past year, we have witnessed the shrinking of space for civil society, the infringement of corporate greed on the rights of people and the killings of human rights defenders. Feminists leading on climate and environmental justice must also be heard in spaces like the World Conservation Congress, at UN climate negotiations, summits on energy and economy, and financing mechanisms like the Green Climate Fund. Women’s full and equal participation is a basic tenant of women’s human rights, and initiatives to increase women’s leadership in politics via training and campaign skills, or in diverse sectors such as science, technology, engineering, and math should be applauded. WEDO’s own Women Delegates Fund works to improve the representation of women leaders in climate negotiations. 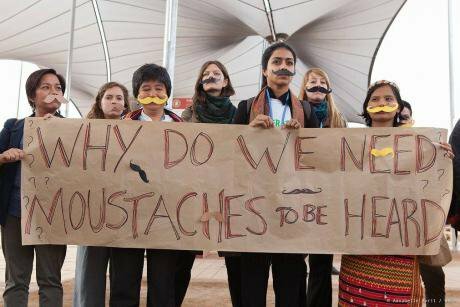 Activists demanding women’s voices be heard at COP22. Credit: Annabelle Avril.We must further resist the corporatisation of feminism and gender equality. After all, the crux of our climate challenge can be summed up by profit over planet and people. Whether it’s the over-consumption of the developed world in general, or inequality within countries, for a global feminist resistance to truly work and demand climate justice it must challenge a capitalist economic system and private sector initiatives which claim to be supporting women’s rights. For example, when UN Women chooses to partner with a corporation like Coca-Cola with the aim of women’s economic empowerment, it must equally challenge the corporation’s role in driving environmental instability, as well as impacts on health. Public-private partnerships which bolster the image of corporations while undermining political critique, and overshadowing negative environmental impacts, will not fuel the feminist revolution we need. Demanding climate justice means calling for systemic change. Demanding climate justice means we are calling for systemic change. It is not a call for individual actions to protect the environment. Protecting funding for Planned Parenthood is just as critical as ensuring the country fulfills and strengthens its commitments to the Paris Agreement, ensuring funding for developing countries to mitigate and adapt to climate change as both a legal and moral obligation. Feminist movements in developed countries must also tackle issues of overconsumption as part of organising for women’s rights. 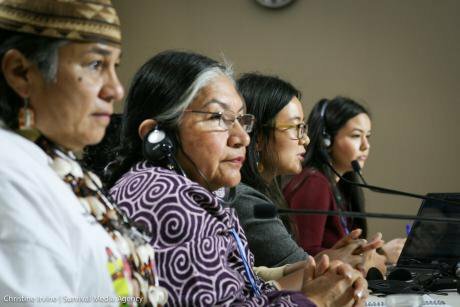 Feminist leaders, particularly indigenous women and grassroots organisers, have to be at the frontlines of climate change decision-making. Examples highlighted in the 2016 report Gender-Just Climate Solutions – including women-led clean-cookstove and solar installation projects in Tanzania, women-owned and operated energy cooperatives in Germany, and female entrepreneurial “energy shop” initiatives in Mozambique – women are already developing solutions to climate change which ensure rights and promote equality. The Nobel Women's Initiative conference takes place in Germany 13-16 May. Follow 50.50's coverage of the event.